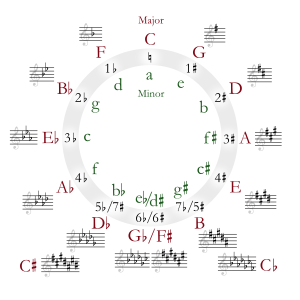 C-sharp minor is a minor scale based on C♯, with the pitches C♯, D♯, E, F♯, G♯, A, and B. Its key signature consists of four sharps. There are only two known symphonies in the 18th century written in this key. One of them is by Joseph Martin Kraus, but he appears to have found the key difficult since he later rewrote it in C minor. Even in the following two centuries, C-sharp minor symphonies remained rare. Two notable examples are the first movement of Mahler's Symphony No. 5 and Prokofiev's Symphony No. 7. This key occurs more often in piano literature from the 18th century onwards. Domenico Scarlatti wrote just two keyboard sonatas in C-sharp minor, K. 246 and K. 247. But after Beethoven's Piano Sonata No. 14 (Moonlight Sonata), the key became more frequent in the piano repertoire. Beethoven himself used this key again in the outer movements of his String Quartet No. 14 (Op. 131, 1826). Even so, Johannes Brahms still felt the need to rewrite his C-sharp minor Piano Quartet in C minor, which was published as Piano Quartet No. 3 in C minor, Op. 60. Alkan composed the second movement (Adagio) for Concerto for Solo Piano in C-sharp minor. Frédéric Chopin often wrote in this key: examples include the Fantaisie-Impromptu, Étude Op. 25, No. 7, Scherzo No. 3 (Op. 39), Waltz Op. 64, No. 2, and Nocturnes No. 7 (Op. 27, No. 1) and No. 20 (Lento con gran espressione). More examples of works in C-sharp minor include Rachmaninoff's Prelude in C-sharp minor (Op. 3, No. 2), Scriabin's Étude in C-sharp minor, Op. 2, No. 1 (Scriabin), Franz Liszt's Hungarian Rhapsody No. 2, and Tchaikovsky's Piano Sonata in C-sharp minor. Piano concertos written in C-sharp minor include Erich Wolfgang Korngold's Piano Concerto for the Left Hand, Op. 17, Nikolai Rimsky-Korsakov's Piano Concerto, and others by Ferdinand Ries, Xaver Scharwenka, Amy Beach, Miriam Hyde and Issay Dobrowen. Dmitri Shostakovich's Violin Concerto No. 2 is in C-sharp minor. Jules Van Nuffel wrote his psalm setting In convertendo Dominus for choir and organ in C-sharp minor. La Bouche – "Be My Lover"
Lady Gaga featuring Colby O'Donis – "Just Dance"
Selena Gomez – "Love You like a Love Song"
Linkin Park – "One Step Closer"
Led Zeppelin – "No Quarter"
Madonna – "La Isla Bonita"
Men at Work – "Who Can It Be Now?" Mr. Mister – the chorus in "Broken Wings"
Britney Spears – "Oops!... I Did It Again"
^ Constantin Floros, translated by Vernon Wicker: Gustav Mahler: The Symphonies (Portland, Oregon: Amadeus Press, 1985) p. 141 "the choice of key of the movements (C-sharp minor – A minor – D major – F major – D major);"
^ Benjamin, Levin; Lukasz, Gottwald; Nathaniel, Ruess; Kesha, Sebert; Henry, Walter; Kesha (2012-10-31). "Die Young". Musicnotes.com. Retrieved 2018-12-10. ^ "Skinny Love" sheetmusic sample – Note: The original version of the song by Bon Iver is not in C-sharp minor, but rather in A minor. ^ Amir, Saraf,. "La Bouche "Be My Lover" Sheet Music". www.musicnotes.com. Retrieved 2015-06-10. ^ Ed, Sheeran,. "Ed Sheeran "Shape of You" Sheet Music in C# Minor (transposable)". Musicnotes.com. Retrieved 2017-01-18. ^ Desmond, Child; Robi, Rosa; Ricky, Martin (1999-09-13). "Livin' la Vida Loca". Musicnotes.com. Retrieved 2018-12-10.